Exercise leads to both types of good moods psychologists talk about: positive high activation (feeling alert, excited, happy) and positive low activation (feeling calm, content, relaxed). A significant mood boost requires at least 20 minutes of exercise. I start with this question whenever I give a talk about exercise and mental health. Like the trial attorney who asks only questions she already knows the answers to, I pose the query with certainty about the outcome. Research backs the near-universal observation that you almost always finish a workout in a better mood. Exercise leads to both types of good moods psychologists talk about: positive high activation (feeling alert, excited, happy) and positive low activation (feeling calm, content, relaxed). So if you want to lift your spirits with exercise, the most important thing about your workout is that it exists. Anything is better than nothing. That said, how you structure your workout - how long, how hard, etc. - can supercharge the post-exercise mood boost. Understanding how to construct a mood-lifting workout starts with understanding why exercise leads to feeling better mentally. You've probably heard of endorphins, which are among the body's natural opioids and circulate in greater numbers during exercise. The exercising brain enjoys higher levels of endorphins as well as endocannabinoids (which act on the same receptors as the psychoactive ingredient in marijuana), neurotransmitters and other feel-good chemicals. Another contributor to a calmer mood is the slight increase in core temperature that occurs during exercise, which reduces muscle tension. "After exercise, the nervous system is quieter, your muscles are more relaxed, and that feeds information into your brain that you interpret as a good feeling," says Carson Smith, a kinesiology professor at the University of Maryland. Your mood, however, is determined by more than what's going on inside your body. Exercise is a regular opportunity to hone your self-efficacy, which is the belief that you can accomplish goals you set for yourself. Pushing through a workout makes you feel better about yourself and reinforces the knowledge that you can be successful in challenging situations. For some people, the harder the workout, the better their mood after. "The pleasure of that achievement overshadows any sense of displeasure that existed during the actual exercise," says Panteleimon Ekkekakis, a professor of exercise psychology at Iowa State University. With that background, here's what research and experience suggest about workout variables. Aerobic exercise tends to trigger more release of the feel-good brain chemicals than anaerobic workouts, such as weightlifting. But the best type of workout is one that you do. If you love spin class, go to it. If running is your thing, hit the road. If weightlifting is most appealing today and swimming calls tomorrow, heed those hints. Doing exercise you enjoy is the key to consistency. 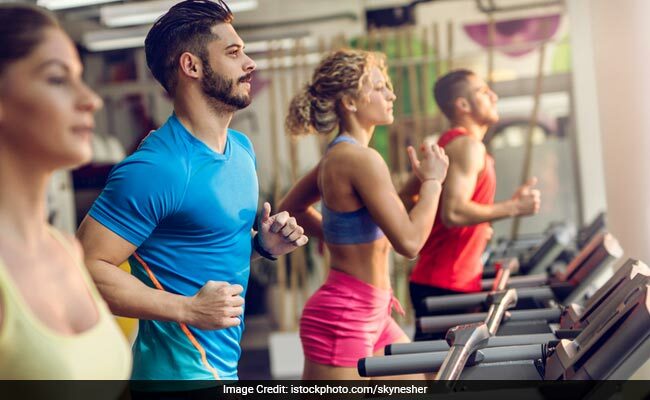 Any form of purposeful exercise trumps incidental physical activity, according to a Heidelberg University study that asked subjects to record their moods after both working out and engaging in "nonexercise activity" such as climbing stairs or cleaning. Only the workouts boosted mood; in fact, the daily-life activities decreased feelings of calmness. So, make the effort to do some form of exercise. A short walk, a brief session of stretching or yoga, or a handful of body-weight exercises (planks, pushups, dips, etc.) all count. Even a 10-minute walk around the block increases blood flow and gives you the chance to mentally regroup and improve your mood. A significant mood boost requires at least 20 minutes of exercise, according to most research. Longer can be better, assuming you have the endurance and don't get tighter or more sore as you keep exercising. Endorphin levels, for example, start to surge after about an hour of moderate aerobic exercise, and increase exponentially after. In part because of higher endorphin levels, many people find that longer workouts tend to produce the pleasant calm of the positive low activation mood mentioned earlier. Keep in mind, though, that psychology plays an important role. A University of Wisconsin study found that people were in a better mood when they picked their own intensity level instead of a prescribed moderate-effort workout, even though their endocannabinoid levels were higher after the latter. David Raichlen, the anthropology professor behind the University of Arizona research, says, "My biggest mood boosts are after tempo runs or intervals," which are much more intense than a moderate-pace outing. Higher-intensity workouts help you blow off steam during the session and bask in a paragon-of-virtue sensation afterward. Light-intensity workouts can be the best choice when you're fatigued and feel you need to decompress. With experience, most people learn how to match their pre-exercise mood with the workout intensity that will produce the best post-exercise mood. There's a growing body of research in favor of "green" exercise, or working out in nature. Brain researcher Jeffrey Burns, of the University of Kansas, does much of his winter running on a treadmill. "I don't feel like I get the same benefit from that as I do from being outdoors and letting my mind go free," he says. If your schedule, the weather, the local geography and your preferred type of exercise allow it, make the effort to get outside to play. You don't have to go deep in the woods to get a nature boost. A Scottish study looked at people's brain waves as they strolled through three sections of Edinburgh - a shopping area, an urban park and a busy commercial district. During the eight to 10 minutes the people were in the park, brain activity associated with frustration and long-term arousal fell, while activity associated with meditation and calmness rose. If you're on a conventional schedule, there's much to be said for a morning workout that puts you in a better mood as you head into the day's responsibilities. Of course, there's also much to be said for a post-work exercise session that helps you reset emotionally. Some research and lots of anecdotal evidence favor morning exercise for the simple reason that, with fewer claims on your time at sunrise, you're more likely to do it. But remember: The best workout for a mood boost is one that happens. Midday or early evening exercise might mesh better with your schedule. Whatever time you prefer, try to stay flexible. One survey found that people who habitually exercised at the same time of day didn't work out if they missed their usual window, while those who weren't tied to a specific time had greater overall exercise consistency. The takeaway: Anticipate challenges to your schedule, find a way to work out and reap the mental benefits.